Here are the loudest alarm clocks for heavy sleepers that are designed to produce a tonne of volume output to wake you up from a deep sleep. These alarm clocks come with virtually all the features you need, including the ability to adjust the alarm volume level, snooze timer, vibration and buzz. It also comes with a center LED screen which tells you the time and a conveniently located snoozer button for you to snooze the alarm clock in the morning. Our experts have tested over a hundred alarm clocks to determine which ones produce extra loud sound with adjustable tone and volume control. They are designed to shake you awake with built-in powerful bed shakers and red flashing alert lights. These alarm clocks are power-consumption friendly and can last for a long time on a single battery. If you are looking for a loud alarm clock to wake you from heavy sleep, be sure to check out our top picks below! The Sonic Dual Alarm Clock is a loud alarm clock for heavy sleepers that are designed to produce extremely loud alarm ring volume with built-in bed shaker. It rings really loud with 113 dB of volume and vibration and it lets you adjust both the tone and volume. It features a powerful 12-volt bed shaker that you can put underneath your mattress or pillow to shake you awake along with the loud alarm. There are also built-in red flashing alert lights, a 5-level dimmer as well as battery backup. It features dual alarm and is equipped with both 12 and 24 hour time capability. In order to ensure that your clock is set up properly it provides a test function. We particularly liked the number of options it offers and is a loud alarm clock that can be placed anywhere near your bedside. Besides waking up heavy sleepers, it is also suitable for situations like a dorm room where you want to wake up early without disturbing others, as you can wake silently by turning off the volume and adjusting the strong bed shaker. Overall, the Sonic Dual clock is a loud alarm clock for heavy sleepers with an incredibly loud wake-up alarm and built-in options. The Sonic Dual Loud Alarm Clock performs really well and will wake almost anyone up with its 113 dB volume output. Its loud volume makes it a great choice for heavy sleepers and those who have hearing loss. Even if you can’t hear the alarm, the shaker will do the job of waking you up. The lights are a big advantage, especially if the room is dark or dim. If you need a clock that’s loud and also that has adjustable tone, this one is a good choice. The ability to adjust the tone makes a big difference, especially to people with hearing loss that can make it ring in either upper or lower pitches. It is almost impossible to hear it when the tone/pitch is set on the highest level, as it might go above your ability to hear, but at the lowest tone it is enough to wake anyone even out of deep sleep. The bed shaker is also effective and you can place it under your pillow or in your pillow case in order to make it more effective. It’s an alarm clock that provides a good variety of options to wake you up. 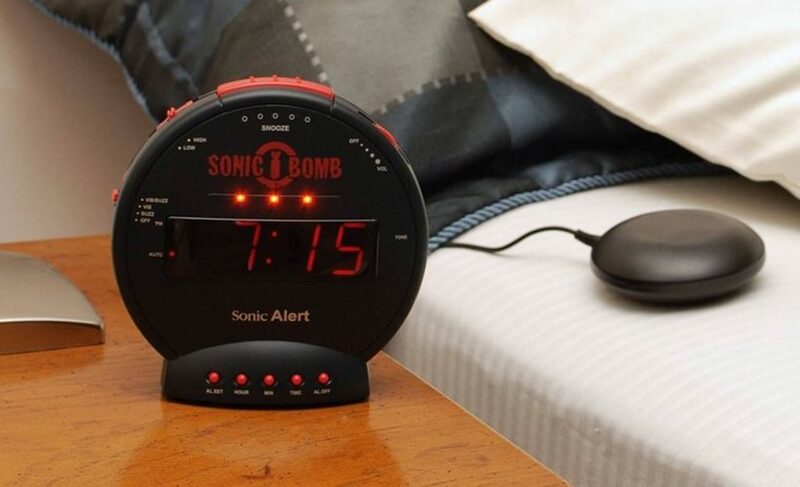 The Sonic Bomb Loud Dual Alarm Clock has a sleek and modern looking design. It is very lightweight and compact. The clock has an LED bar on top which blinks red and other lights that also do the same when the alarm goes off. It has a large display and a battery back up in the case of a power outage. Setting the clock is very easy and you simply have to push the button and let the clock cycle through every hour and minute. However, it’s very fast and, when you get close to the time you want to set the alarm, you switch to the slow button to get the right timing adjustment. It also has a different sort of alarm pattern. It beeps three times, stops, then repeats until you tap the sleep bar or turn it off. There are also nice features like the ability to adjust snooze time from 1-30 minutes and the ability to select the alarm duration from 1-59 minutes. The build quality looks sturdy and has low battery power consumption so that you can use the alarm clock for long periods of time without changing batteries. The Verdict? The Sonic Dual LED clock is a loud alarm clock for heavy sleepers that can produce enough volume to wake virtually anyone from a deep slumber. Featuring 113 dB of loudness, vibration, a powerful 12-volt bed shaker as well as built-in red flashing alert lights, it ensures that you will wake up on time. This clock also includes a variety of options to allow you to use it without disturbing other people around you and it is also suitable for people with hearing loss. The design is sleek and the control buttons are easy to use, giving you the ability to adjust the volume and time easily. Overall, the Sonic Dual loud alarm clock is a great choice for heavy sleepers with a loud 113 dB of sound and we highly recommend them. 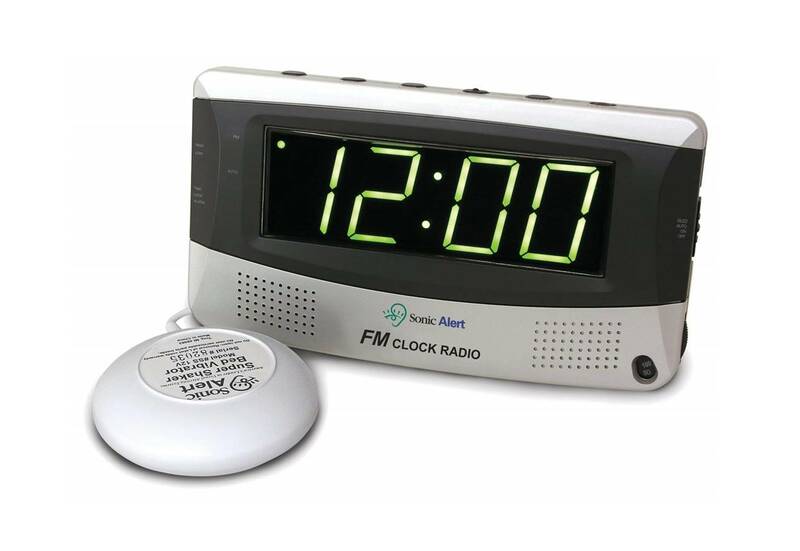 The RCA Digital Alarm Clock is an affordable, simple and compact loud alarm clock for heavy sleepers. It comes with large 1.4-inch red LED display for increased visibility where the time and alarm indicator are clearly displayed. It features high/low brightness control to let you adjust the time readout as needed. It is also equipped with a snooze function and a large full-width snooze button on the top front. In total, there are three slide buttons on the back: one to turn the alarm on and off, a dimmer for high/low brightness and one that lets you set the time and the alarm. This alarm clock has easy to use control buttons with simple user interface and large full-width snooze buttons on the top for convenience. You can also enjoy a comfortable and prolonged wake-up with the repeating snooze option, and experience no stress when setting the time or alarm. It is AC powered but it also features a battery back-up in case of power outage (the 9V battery is not included in the package). On the whole, we found the RCA Digital loud alarm clock is a great choice for heavy sleepers with a tonne of functions to choose from and we highly recommend them. The RCA Digital Loud Alarm Clock is very effective in terms of sound volume and has the capacity to wake up heavy sleepers. It is loud enough to wake you up from a deep slumber with very loud alarm sounds. The alarm clock has a simple interface and a large 1.4” display with battery back-up. We liked the fact that it comes with a red 1.4” LED display for increased visibility with easy to use control-buttons. It is perfectly suitable for near-sighted people and people with slight visual impairment as the numbers are big and bright enough to be visible at 15 feet and it is possible to see them from across a small apartment. It is also recommended to people that are sensitive to light in a dark bedroom, as this clock doesn’t create that nimbus of light around it that many clocks have. Overall, it’s a loud alarm clock that gets the job done with loud ring tones for heavy sleepers. We were pleasantly surprised by the design and build quality of the RCA Digital Alarm Clock considering its price range. The simplistic and minimalist design makes it really easy to use. It comes in plain black color that blends in nicely with modern home interior decor. It’s well-made and demonstrates sturdy build quality while simultaneously being small and lightweight. You might want to secure it on the bed-side stand if you are clumsy in the morning because it can fall down easily due to its small size and weight. The alarm clock is portable and the screen is big enough to be visible from a distance. It has the option for battery back-up so that it can keep the time in case of power outage. The buttons are simple and functional and easy to operate. We found it really easy to set the time, the alarm volume and to turn the alarm on and off. The display brightness is easily adjustable and you can customize it to fit your own taste. The snooze button is large and easy to press, a big advantage especially if you have to wake up while it is still dark outside. The Verdict? The RCA Digital loud alarm clock for heavy sleepers is a great choice for those who need a powerful alarm clock to wake up on time. Its battery backup will not let you down in case of power failure and it is really easy to set up both time and alarm time. It is loud enough to wake up heavy sleepers without disturbing everyone around you. The design is minimalist but functional and it has a 1.4-inch red LED display for increased visibility. It is suitable for people that are nearsighted as the numbers are big and bright enough to be visible and the time and alarm indicator are clearly displayed. The snooze button is large and easy to press. 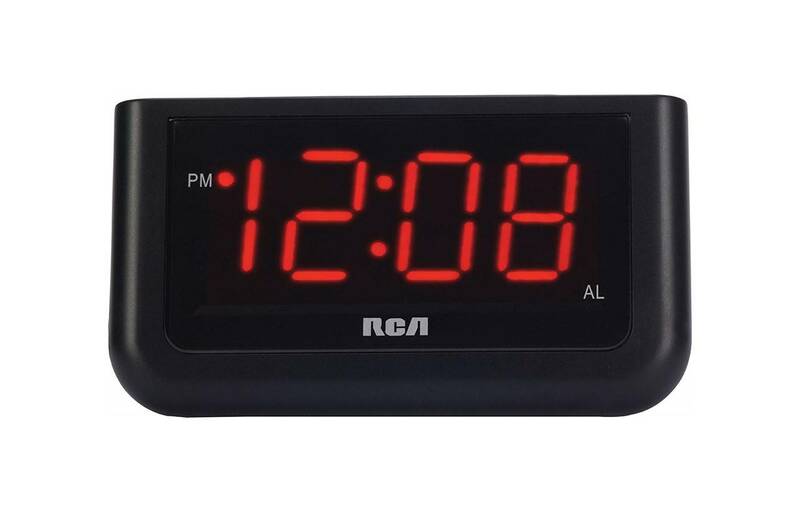 The RCA Digital Alarm Clock can be AC powered or battery powered; the time and alarm indicators are clearly displayed and the brightness control allows you to adjust the time readout as required. It also comes with a full-width snooze button and an alarm indicator for convenience. Overall, the RCA Digital loud alarm clock is a really good alarm clock for heavy sleepers with loud volume control and easy to use control buttons. The Philips Wake-Up Light Alarm Clock is a loud alarm clock for heavy sleepers that uses colored sunrise simulation and sunset fading night light to wake you up naturally. It features a light therapy lamp and natural sunrise alarm clock combined with natural sounds in order to improve your sleep, energy and wellbeing. 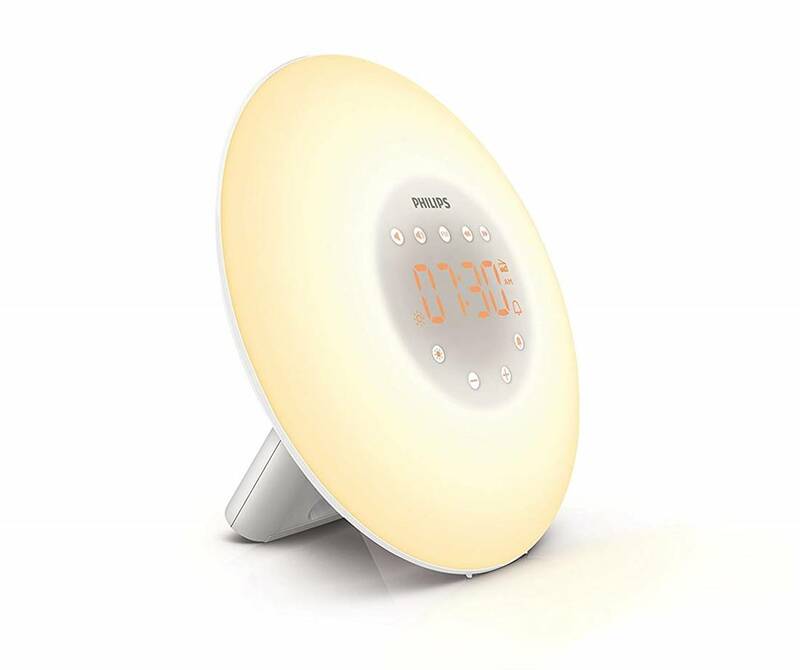 The colored sunrise simulation alarm clock wakes you gradually with a natural light lamp: the wake-up light brightness gradually increases within 30 minutes from dim yellow until the room is filled with bright yellow light. Simultaneously, the clock’s speaker plays a choice of 5 different nature-inspired, wake-up sounds or FM radio with tap-to-snooze. At night, a light-responsive dimming feature guides you to sleep. Its PowerBackUp+ feature maintains internal clock settings and back-up alarm for at least 8 hours in the event of power failure. The Philips Wake-Up Light Alarm Clock can also be used as a bedside reading lamp with 10 brightness settings. The Philips alarm clock is plug and play with no assembly required. Overall, the Philips Wake-Up clock is a loud alarm clock designed for heavy sleepers with a modern design and natural bird song alarm. The Philips Wake-Up Light Alarm Clock’s performance is impressive. Before going to bed you can set the “sun to set” at 15, 30, 45, or 60 minutes later. Then, you can use it as a bedside lamp, until its light gradually goes down. When it is time to get up, the “sun” starts coming up gradually enough that you don’t even notice until you get up. The process of increasing light intensity stimulates your body to wake up naturally. By the time light has filled the room the chosen natural sound starts ringing, which can range from birds chirping, ocean waves, classical music, or FM radio. We found the bird chirping sounds very natural. In fact, you set up two different wake up alarms on the Philips Wake-Up Light Alarm Clock: one for the light and one for the sound. They actually wake you up gradually and not at once by being loud and sudden. There is the option to personalize the light settings with ten different light intensities in order to wake up more or less gradually. The Philips Wake-Up Light Alarm Clock features sleek and modern looking design. It comes in plain white colour to better reproduce the different light temperature. There is no need for replacement bulb. We particularly liked the fact that this clock can be used both as a clock and a night lamp. At night, the wake-up light offers relaxing dimming and sunset-simulating light that helps to guide you towards restful sleep. When the bedroom is dark, the display automatically adjusts the brightness levels to a pleasing, soft level. The Philips Wake-Up clock has 20 brightness settings and functions as both a convenient bedside lamp for reading or relaxing at night. The snooze button works without any issues but you might find its sensitivity too high for your preference. The build quality looks sturdy and durable and works straight out of the box without any issues. The Verdict? The Philips Wake-Up loud alarm clock is a good investment for heavy sleepers that want an alarm clock with gradual wake-up alarm features. The alarm clock simulates sunrise and sunset lighting which helps you wake up and sleep comfortably, and the sound effects are pleasant and natural. We particularly liked the different options for brightness as they really let you customize your experience. The fact that it can also be used as a bedside reading lamp is a big advantage as it makes it more than just an alarm clock. The PowerBackUp+ feature makes this clock reliable in the case of power failure. It also features a sturdy build quality and can be used for long periods of time without any issues. The Philips Wake-Up Light Alarm Clock is also a solution for people who want to reduce their dependency on cell phones. Overall, the Philips Wake-Up loud alarm clock is designed for a comfortable wake-up experience and comes with a variety of useful features to get started for the day. The Sonic Alert SB300SS Loud Alarm Clock is an alarm clock designed for heavy sleepers with multiple features to wake you up. It features an 113db extra-loud alarm with adjustable tone and volume control. Along with the sonic alarm, a powerful 12 volt bed shaker is included in the package that is supposed to be placed on your mattress to wake you up. The clock is equipped with both 12 and 24 hour time capability and features a large (1.8″) LED reading display. Additionally, it includes battery backup in order to maintain the proper time in the event of a power outage. It features a 5-level dimmer to allow you to set up brightness the way you prefer it and it offers a test function to ensure that your clock is set up properly. Overall, the Sonic Alert SB300SS is a loud alarm clock designed for heavy sleepers with 113db extra-loud tone and volume controls with 12/24 hour time capability. The Sonic Alert SB300SS Alarm Clock is loud enough to wake up any kind of heavy sleeper with 113db of sound and a 12 volt bed shaker. It also offers the option of choosing between the loud alarm sound and the powerful bed shaker or using them both. The 12 volt bed shaker works like a charm and helps you to wake up without disturbing others around you. The bed shaker is really powerful and easy to feel. The option to adjust the tone is very useful for people with hearing impairment as they can set the alarm to the pitch that they are able to hear. The alarm clock has a maximum volume output of 113db and is definitely powerful enough to get you out of bed from a deep sleep. We liked the dimmer switch that lets you choose to have big bright numbers or dim ones. It comes with a battery backup in case there is a power outage making it really reliable. 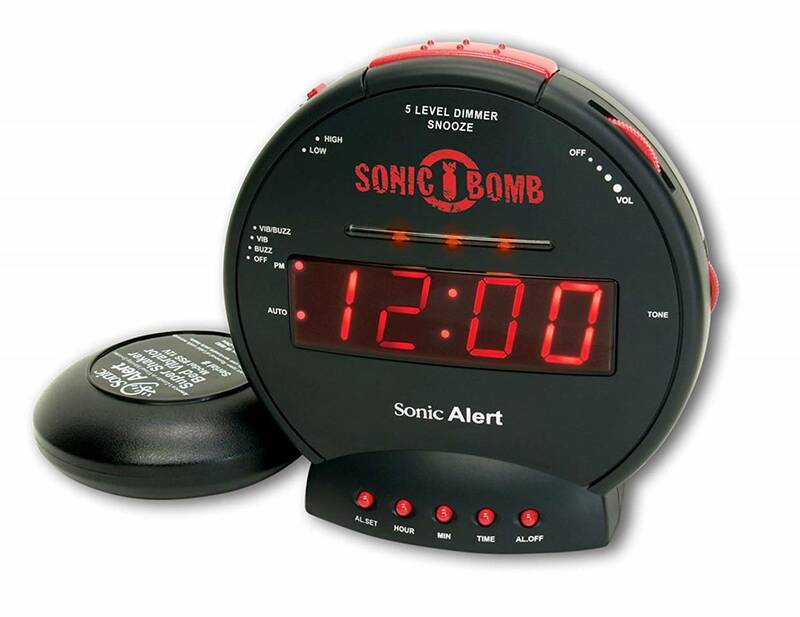 The Sonic Alert SB300SS Alarm Clock is compact and portable enough for travel. It has silver and black color that blends in nicely with modern home interior decor. It is AC powered and we particularly liked the fact that the vibrating disc has a pretty long cord, so you don’t have to be right next to an outlet (the cord is about 3-4 feet long). Also, the time display flashes when the vibrating alarm is going off, so if you have already gotten out of bed and forgot to turn off the alarm, it provides you with a visual reminder to turn it off. The sleep button is easy to press and conveniently located at the top of the alarm clock. The build quality looks quite sturdy, taking into consideration the materials used. We liked the fact that the loud alarm clock comes with a 5-level dimmer and test function to ensure that the clock is setup properly; it has battery backup to maintain the proper time in the event of a power outage. The Verdict? The Sonic Alert SB300SS is a loud alarm clock with 113db of sound output designed to wake heavy sleepers. The volume controls are easy to navigate and it is packaged with a powerful 12 volt bed shaker with 12/24 hour time capability. It is possible to adjust the brightness with a 5-level dimmer and it offers a test function to ensure that your clock is set up properly. The battery backup that is included ensures that it will work in case of power failure. The design of this clock is sleek and modern looking and compact. The volume controls are simple and intuitive to use; with a maximum power output of 113dB the clock delivers enough volume to wake you up. The 12 volt bed shaker is also a good alternative if you don’t want to disturb your neighbors with this clock. Overall, the Sonic Alert SB300SS is a loud alarm clock designed for heavy sleepers with a powerful 12 volt bed shaker and we highly recommend them. The SVINZ Radio Bluetooth Dual Alarm Clock is a loud alarm clock that features FM radio and it can also be used as a Bluetooth Speaker. You can set two different and independent alarms (for two different people) with full range volume setting. You can snooze and wake to FM radio or buzzer with 1-7, 1-5 or 6-7 days alarm modes. The FM radio features 20-station presets and digital tuning. The clock supports dual time mode to select 12 hour or 24 hour time mode even for alarm time. You can also use this clock as ambient light or bedside reading lamp by selecting your favorite color mode: warm white, blue, purple, green, red, orange, pink, indigo, color changing etc. The LED dimmable display features 5 brightness levels and can also be turned off. The clock can be used as a bluetooth speaker, letting you enjoy your music and it can pair with voice prompts. An additional auxiliary input allows you to connect to other audio sources. The clock contains a USB Charging Port with 1.5A output to charge devices at full speed and overcharging protection. It is compatible with Apple and Android phones and tablets as well cameras, consoles and more USB devices. Finally, the SVINZ Radio Bluetooth Dual Alarm Clock features long lasting button cell battery backup (included) that maintains date, time & alarm settings after every power interruption. Overall, the SVINZ is a loud alarm clock designed for heavy sleepers and we highly recommend them. The SVINZ Radio Bluetooth Dual Alarm Clock provides loud alarm ring tones with FM radio and Bluetooth speaker functionality. It features digital FM radio with 20-station presets and digital tuning; you can extend the FM antenna for the best reception. The FM radio can be one of the wake-up sounds for the alarm as well. We particularly liked the fact that the clock can also work as a Bluetooth speaker that can play your music wirelessly from tablets, phones and computers as well as any bluetooth-enabled device. In addition to that, the auxiliary input allows you to connect to other audio sources. The loudspeaker delivers high quality crystal clear sound through high-performance driver and rich bass. It has enough volume output to fill a room without any distortion in the sound quality. Finally, the clock can also be used as a bedside lamp and it is possible to change its color, and even to set it to change colors by itself. The SVINZ Clock dual alarm radio can be set and used independently with full range volume settings. We certainly liked the strap that allows it to be placed anywhere and there is also the possibility to mount the speaker to a bipod. The SVINZ alarm clock can be used as ambient light or bedside reading lamps by selecting your favorite color modes including white, blue, purple, green, red and orange. The clock also features a very handy and convenient USB port in order to charge smart devices such as cellphones and tablets. An optional backup battery keeps the clock working during a power outage. The different 1-7, 1-5 or 6-7 days alarm modes allow you to set up the clock easily. The LED Display has 5 levels of brightness and it enables you to set the time display brighter during daytime and dimmer at night. The alarm clock comes with a high-performance speaker that delivers rich bass and crisp sound performance with voice prompts. The 1.5A output can be used to charge devices including Apple and Android phones and tablets as well as cameras, consoles and USB devices. The Verdict? The SVINZ Radio Bluetooth Dual Alarm Clock is a loud alarm clock with versatile features including FM radio and Bluetooth streaming. Its biggest advantage is its versatility: it is simultaneously an alarm clock, an FM Radio receiver, a Bluetooth speaker and an ambient night lamp. The latter is very convenient for those moments you get out of bed in the dark but can’t use a light. The FM Radio has 20 preset stations and the bluetooth speaker can be paired with smart devices so that you can enjoy high quality music in your bedroom. Featuring USB charging option for smart devices and a battery backup in case of power failure, it is a very reliable solution for waking up in the morning. It also comes with a long lasting button cell battery backup that maintains the date, time and alarm settings after any power interruption. The entire package comes with the alarm clock radio, AC adapter and user guide for easy reference. Overall, the SVINZ Radio FM Alarm clock is a loud alarm clock suitable for heavy sleepers and comes with versatile functions including FM and Bluetooth speaker capability. The Clocky Runaway Alarm Clock is a loud alarm clock on wheels that runs away beeping in order to get you out of bed. It jumps from a 3-foot high nightstand, and then it runs off in different directions every day, bumping into objects, changing direction again, and beeping until you wake up, get out of bed and turn it off. It works both on carpet and wood. You can set your own snooze time and control how long your snooze lasts. 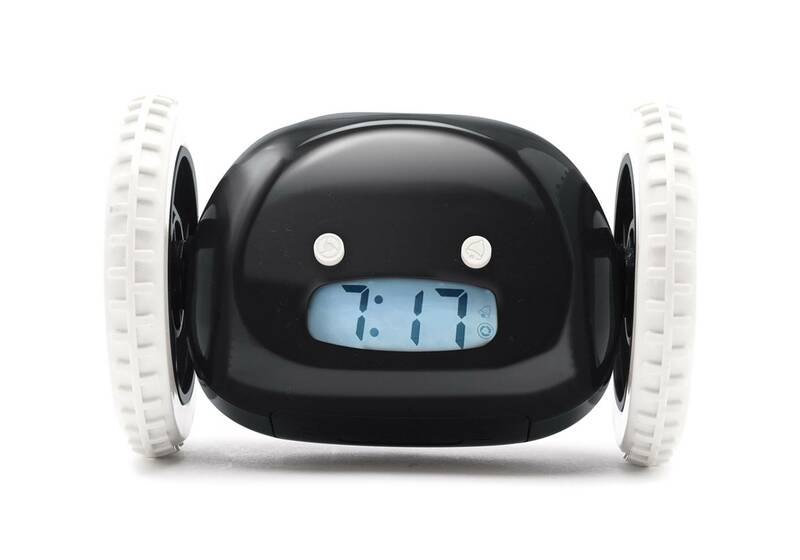 The next time you hit snooze, Clocky will roll into action. You can also disable the snooze completely and when your alarm goes off, this clock will start running immediately. It also features a loud, beeping R2D2 like robotic sound that is hard to miss and to sleep through. The Clocky Runaway Alarm Clock is highly recommended for heavy sleepers and has a unique alarm that is extra loud. Overall, the Clocky Runaway is a loud alarm clock for heavy sleepers that has a very loud unique alarm clock running feature and comes highly recommended. The Clocky Runaway Alarm Clock’s performance is impressive and it is a really efficient solution for heavy sleepers. The sound is loud enough to wake you up and its fun and robotic quality definitely gets anyone out of bed in a rush. However, the sound that it emits is not too repetitive but it is somewhere between annoying and acceptable in order not to wake you up in a bad way. The runaway movements of the clock are effective at making you get out of bed and the clock seems to always find somewhere to hide. The combination of the R2-D2 sound and the clock running makes anybody jump out of bed. However, we would recommend that you set it on the floor and not on a table because falling repeatedly might reduce the life span of the clock. We found it easy to set up both time and alarm time and being able to set the snooze time is a very useful feature. The Clocky Runaway Alarm Clock is a quite innovative solution for those who repeatedly press the snooze button and have trouble getting out of bed. The Clocky Runaway Alarm Clock has a unique design and is capable from jumping from a 3-foot high nightstand and run off in different directions. The clock runs in different directions every day, bumping into objects, changing direction and beeping until you wake up. It comes in plain black color with white wheels, while its buttons and screen make it look like a human face. The build quality looks quite sturdy and durable. We also liked the fact that you can set your own snooze time and control how long the snooze lasts. You can also disable the snooze completely when your alarm goes off. This alarm clock is particularly loud and the beeping R2D2 like robotic sound is hard to miss and virtually impossible to sleep through. It’s a great and fun alarm clock for heavy sleepers to get out of bed in the morning. The Verdict? The Clocky Runaway Alarm Clock is a loud alarm clock designed for heavy sleepers with a unique runaway feature. The clock can run both on carpet and wood and it bumps into objects, changing directions and probably hiding somewhere in the room until you get up and turn it off. The sound it emits resembles a lot the R2-D2 sound and it is loud enough to wake you up and impossible to sleep through. The combination of runaway movements and the sound will certainly wake up heavy sleepers and this is the big advantage of this clock. Our only concern is regarding its durability, as falling out of an end table every day might cause trouble in the long run. However, you can solve this problem by setting this clock on the floor every night. It also gives you the option of setting your own snooze time and controlling how long your snooze lasts. Overall, the Clocky Runaway Alarm Clock is a loud alarm clock for heavy sleepers with a unique design, so don’t forget to check it out! The TrendHolders Home LED Alarm Clock is a simple and reliable loud alarm clock for heavy sleepers. It has been designed with simplicity in mind and is easy to setup and operate. The bedside alarm clock comes with an alarm and will continue for 5 minutes ensuring you definitely wake up. There is also a 2-60 minute snooze that can be continually pressed until the alarm itself is switched off. Those features make it suitable for heavy sleepers who need loud sounds to wake up. The clock is powered by plugging the power cord of the included charger into a standard US 120V outlet. The battery backup enables to memorize time and alarm during electric power failures. The clock is also equipped with two USB charging ports which allow you charge two devices simultaneously with total 2.1A output. The TrendHolders Home LED Alarm Clock is a loud alarm clock for heavy sleepers with a minimalist and convenient design, and we highly recommend them. The TrendHolders Home LED Alarm Clock delivers loud sound and reliable performance. It is very easy to set up the time and the alarm time and the controls are intuitive to use. The alarm is loud enough to wake up even the heaviest of sleepers and virtually impossible to sleep through. We liked the fact that you can customize the snooze time, which can range from 2 to 60 minutes, to your preference. The alarm continues for a full 5 minutes after it is set off so that you definitely wake up. The battery backup allows it to retain the time for an impressive amount of time: we had the clock unplugged for a couple of days and when we plugged it back in it still had the correct time. This alarm clock is equipped with two USB charging ports on the digital alarm clock which allow you to charge two devices simultaneously with a total 2.1A output. The TrendHolders Home LED Alarm Clock features a simplistic and minimalist design that becomes its biggest advantage. It comes in plain black color that will fit any house interior. The clock is very lightweight and does not take up a lot of space and thus you don’t need a large desk to place it on. It is also a nice choice for traveling. The large LED digits are bright and clear to see from across the room, and during the night the digits can be dimmed to your own personal comfort level so it does not disturb sleeping. The alarm itself has three different settings for brightness so it is suitable for reading or as a night lamp. The TrendHolders alarm clock has a 2-60 minute snooze that can be continually pressed until the alarm itself is switched off. The build quality is robust and it looks quite durable. It also has battery backup that enables the alarm clock to memorize time during power outages. The Verdict? The TrendHolders Home LED Alarm Clock is a loud alarm clock for heavy sleepers with extra powerful volume output. It has been designed with simplicity in mind and is convenient to operate. It is powered through a charger that is included in the package and needs to be plugged in a standard outlet. It features battery backup that will keep the time and settings in the unlikely event of a power outage or if the power cord gets disconnected. The alarm is loud enough to wake up heavy sleepers and you can customize the snooze time to your liking. The LED digits are large enough to be seen from across a room and their brightness level can be adjusted. The clock also features two very handy USB ports that let you charge your smart devices right next to your bed. The design of this clock is minimalist but beautiful and the build quality is solid. Overall, the TrendHolders LED Alarm clock is a loud alarm clock for heavy sleepers that are definitely worth a closer look. The Vicvol Wake-Up Alarm Clock is a loud alarm clock for heavy sleepers that feature sunrise and sunset simulation. This digital alarm clock has 6 different sounds which let you revel in the sounds of nature. It has 15 different volume levels to choose from. In addition, the clock features FM radio. Its LED screen supports both 12 and 24 hour format. The clock can emit 7 different color lights: warm white, green, red, blue, purple, orange and indigo. It can also work as a bedside reading lamp. This stylish wake up light alarm clock offers a snooze function, giving you an extra 5 minutes of sleep. Setting up this clock was very easy thanks to the detailed user manual. 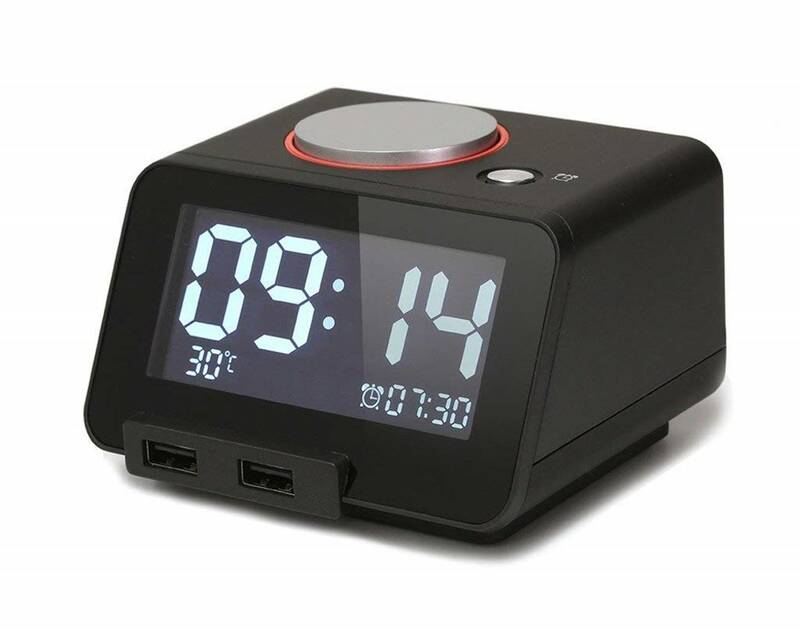 There are three different charging methods for this clock – USB, wall jack input and also an optional battery backup that will keep the time and settings in case of power failure. Overall, the Vicvol Wake-Up Alarm Clock is a very loud alarm clock designed for heavy sleepers that double as a night lamp and FM radio. 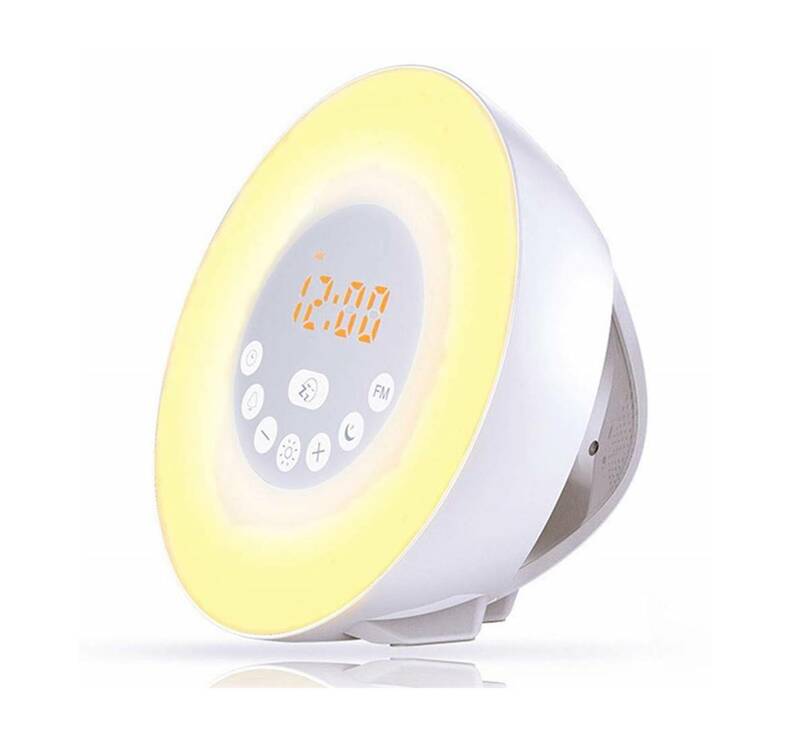 The performance of the Vicvol Wake Up Light Alarm Clock is very good and guides the user to sleep at night while waking him up gently in the morning thanks to the sunrise and sunset simulation. This digital alarm clock has 6 natural sounds such as pure music, violin, birds, forest and waves. It also has 15 volume levels which you can adjust and are perfect for heavy sleepers who need louder alarms. During the sunrise simulation, its wake up light will be on from 1% of the brightness to 100% at set time, warm light will be on at its 10% brightness and lighten gradually, imitating the rising sun, and gently wake you up from deep sleep. The sunset function is made to guide you to natural sleep. The alarm lets you choose between six natural sounds such as pure music, violin, birds, forest, waves as well as beeping. This clock that has 2 Watts of power and 8 ohms of impedance that can produce loud alarm tones to wake you up. One of the biggest advantages of the Vicvol Alarm Clock is the fact that it has many functions: it can work as a bedside light, a night light, an alarm clock as well as an FM radio. We also tested the FM radio and it works without any problem. The Vicvol Wake Up Light Alarm Clock is very stylish with modern looking design.The keys are easy to touch and make setting the time and alarm time a very fast and easy process. Besides the lamp’s brightness customization, the clock also offers 3 brightness levels of time display (bright, dim and off). The adjustable dimmer enables you to set the time display to a brighter setting in daytime and softer one at night or turn off the time display. The clock can also be used as atmosphere lamp by selecting 7 colors for your preferences, including warm white, green, red, blue, purple, orange, and indigo. You can choose one color to match your mood, or set it to circle in colors. Moreover, the warm light has ten brightness levels that suit all situations you are. The clock can also work as a bedside lamp for reading or relaxing with 10 selectable levels of brightness. Additionally, it is designed with rubber anti-slip feet, so it will sit securely on your nightstand. You can charge it in three different ways: you can use a USB charger, a wall jack, and there is also an option to use back up 3x AAA batteries (the AAA batteries are not included in the package). We suggest that using the batteries and the USB cord together in case of resetting the time when the cord gets disconnected. The Verdict? The Vicvol Wake-Up Loud Alarm Clock is a great choice for heavy sleepers with multiple light and volume controls. It is a multi-functional clock that has sunrise and sunset simulation and also doubles as a bedside lamp and an FM radio receiver. The design is sleek and it has a lot of customizable features, such as the brightness levels and the alarm sounds. The build quality is robust, it has anti-slip design in order not to fall from your nightstand. The alarm clock also works with a USB charger, wall jack and 3 X AAA batteries. Overall, the Vicvol Wake-Up Loud Alarm Clock is a great choice for heavy sleepers with 15 volume level settings and provides a comfortable wake-up experience. 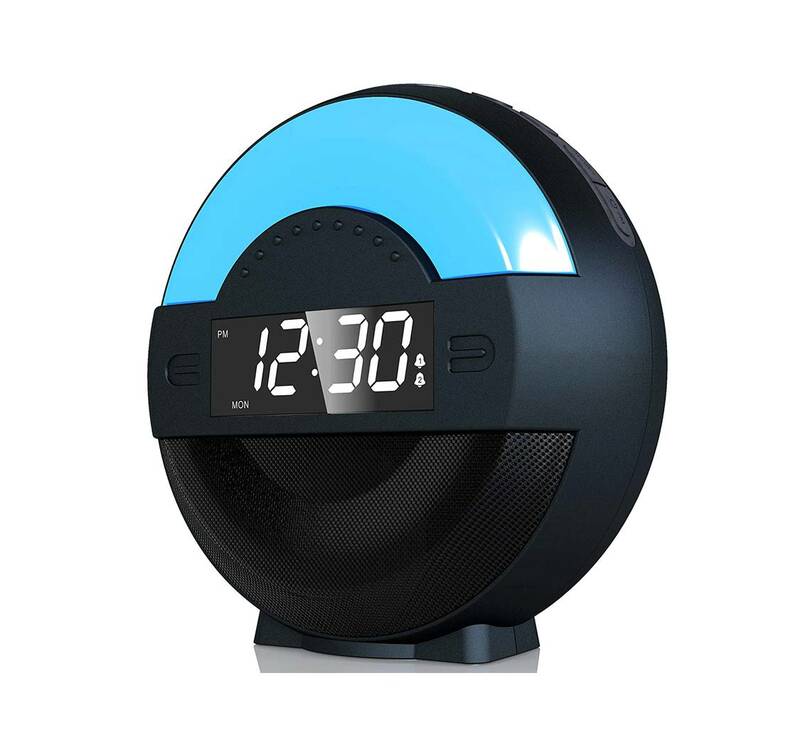 The Leiqi 9″ LED Digital Loud Alarm Clock is a powerful alarm clock for heavy sleepers with adjustable alarm volume. Its 9″ Large Display has big white bold numbers against black face and makes it easy to read the time from across the room. This feature makes this clock very suitable for the elderly or the sight-restricted person. In addition to that, it has a full range brightness dimmer that allows the user to lower the brightness to keep the bedroom darker while sleeping. A touch activated snooze function is included that lets you slightly touch the control panel to activate snooze, making it extremely easy to operate. 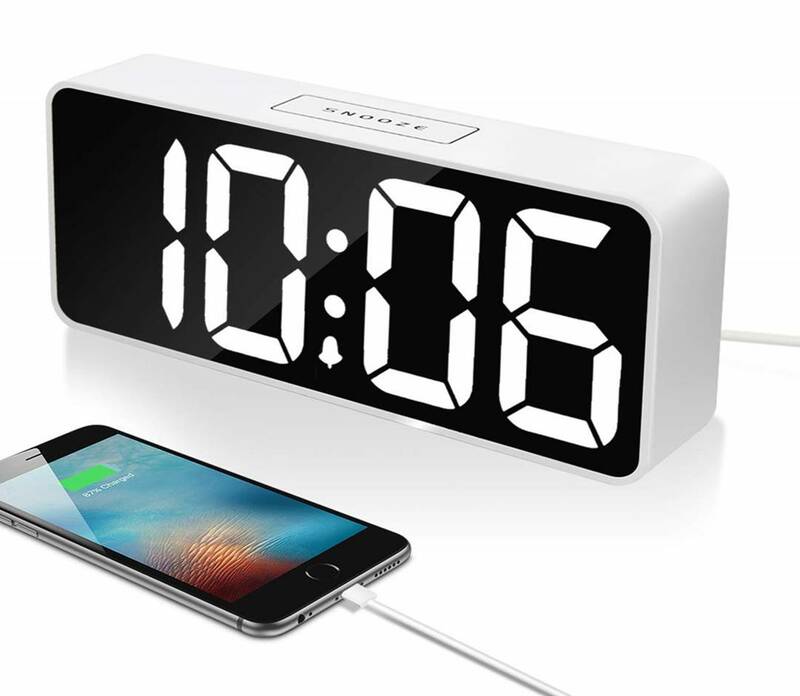 The clock also features dual USB ports: one for the clock’s power supply and another for charging your phone or iPad/tablet. You need to plug a USB charger (included in the package) to make the clock work. Furthermore, the Leiqi Alarm Clock has adjustable alarm volume: the alarm beeps can be set at low or high volume and the gradual ascending alarm feature ensures that you will wake up gently. Overall, it’s a loud alarm clock for heavy sleepers that can wake you up comfortably and we highly recommend them. The Leiqi Alarm clock goes very loud and has plenty of volume to wake up heavy sleepers. Its beeps begin with a subtle, low volume that gradually increases to a higher volume to gently wake you up. You can slightly press the touch pad to activate snooze and get a few extra minutes of sleep. The snooze will repeat every 10 minutes until you turn off the snooze mode by pressing any other buttons. The volume of the beeps is adjustable and the alarm sound can be set at low or high volume easily with a slider according to your personal preference. The Leiqi alarm clock has dual USB ports – one for the clock power supply and the other for charging the phone and ipad. It also features adjustable alarm volume which can be set at low or high volume. The battery backup enables to memorize time as well as the alarm time during electric power failures which makes this clock very reliable. We also liked the built-in USB charger for other devices that is very convenient and makes charging your phone or e-book very handy. 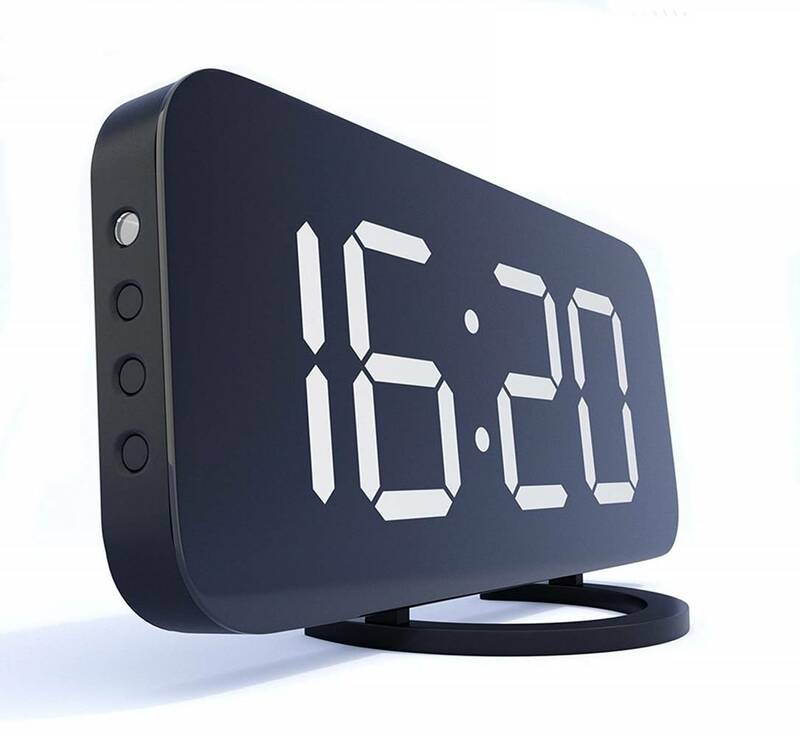 The Leiqi 9″ Large LED Digital Alarm Clock features a minimalist design that blends in nicely into bedroom decor. It is very lightweight and it suits all interiors whether you put it on a work desk, a night stand or in the kitchen. You can either plug it directly or it can operate using battery. It connects via USB and also has a built-in charger for smart devices. It is really easy to set it up and operates straight out of the box. We really liked the fact that the brightness can be adjusted from 0 to 100%, depending on your preferences. The LED display can be clearly seen from across a large room, thanks to its large, white numbers. Lastly, the LED numbers are very uniformly lit and it keeps time with precision (we have it tested against GPS time and it has not lost or gained a fraction of a second). The build quality is sturdy and the quality materials ensure that the Leiqi 9″ Large LED Digital Alarm Clock makes it a very durable alarm clock. The Verdict? The Leiqi 9″ LED Digital Loud Alarm Clock is a great choice for heavy sleepers with superb volume control. It has a lot of customizable features like alarm beep volume and screen brightness that allow you to personalize it. The ascending volume wakes you up gently and the large screen and numbers ensure that it is visible across the room. You just need to touch the screen to enable the snooze function. The USB powering option is very handy in order to charge your smart devices next to you while sleeping or relaxing in your bed. The design of the clock is simple but beautiful and the alarm clock itself is very lightweight. The build quality is robust and the clock looks quite durable. Overall, Leiqi 9″ LED loud alarm clock works like a charm with bright LED timer displays, and has enough volume to wake up heavy sleepers from their slumber. The Homtime Multi-Function Alarm Clock is a loud alarm clock with multiple features and loud volume for heavy sleepers. It features a 3.2 inch LCD large font display for easy readability during the day or at night and has 4 brightness levels easily adjusted by tapping the button at the top of the digital clock. The dual front panel includes USB charging with 3.1A total power (1 x 2.1A ,1 x 1.0A). There is also built-in surge protection to protect against overcharging, surges and overheating, ensuring the delivery of steady power output to each device. This alarm clock supports snooze functions that allow you to sleep for a few extra minutes. The alarm wakes you up gradually, beginning with a subtle, low volume that gradually increases to a higher volume to gently wake you up. The clock also has an indoor thermostat and displays the room temperature on the front panel. The battery backup with 3x AAA batteries (not included in the package) ensures accurate time-keeping during a power failure or disconnection of the power cord. Overall, the Homtime C1 is a highly efficient loud alarm clock built for heavy sleepers and comes highly recommended. The Homtime Multi-Function Alarm Clock delivers very good and reliable alarm volume output. It is really simple to operate as you press the alarm button once when you go to bed (it even has a slight sound to signal it’s been activated, plus appear on the screen) and in the morning a gentle version of Bach’s Well-Tempered Klavier (also known as the Bach-Gounod Ave Maria) plays very softly and gets louder until you press the alarm button. We particularly liked the fact that the alarm’s volume gradually increases over time. You can adjust the volume on the rear of the clock. To snooze, you hit the big round button at the top. The clock also features a temperature read-out which can be set in either Fahrenheit or Celsius. Lastly, there are two easy-to-use USB outlets on the front in order to charge you smart devices (smartphones, tablets, e-books etc.). There is a battery back-up as well in case the electricity goes out during the night, although in this mode the clock does not support charging and lighting for a long time. The Homtime C1 alarm clock has a sleek and minimalist design that blends in easily with home interior decor. We were impressed by how easy it is to program and change the alarm and time settings which are done through a rotary dial. The rotary button makes the process really fast and simple. It is also easy to switch between 12h / 24h modes and the volume control is simple to adjust. The multiple brightness control feature is quite useful as you can dim the brightness using the 4 options from super low light to very bright. In addition, having a thermometer on the screen is very convenient. The screen comes with VN screen technology that offers you nice viewing angles and clarity during the day or night. It also has 25° tilt design and large LCD and font display to ensure you view the time easily and clearly. The build quality is sturdy and this clock seems to have a long life ahead of it as its materials ensure durability. The only drawback of this clock is the length of the wire from the clock to the transformer that sits in the middle of the power wire is not long enough to put the clock on a dresser and have a transformer sit on the flower. It ends up hanging in the air, which may be a bit of an issue. The Verdict? The Homtime C1 Multi-Function Alarm Clock is a very loud alarm clock built for heavy sleepers with many useful features. This alarm clock is reliable, easy to set up and wakes you up with Bach’s Well-Tempered Klavier music. The thermometer on the screen is a nice and useful addition. The rotary button makes setting up fast and easy. The C1 alarm clock has a snooze option and gradual wake up alarm that begins with a subtle low volume and increases to a higher volume to gently wake you up. A lot of effort has been put in the screen’s technology and materials in order to make it visible easily and clearly. It also features four different brightness options so that you can personalize the light that the clock emits. The build quality is sturdy and the clock looks durable. Overall, the Homtime C1 Multi-Function Alarm clock is a great choice for heavy sleepers and comes with a stylish and easy to use design.